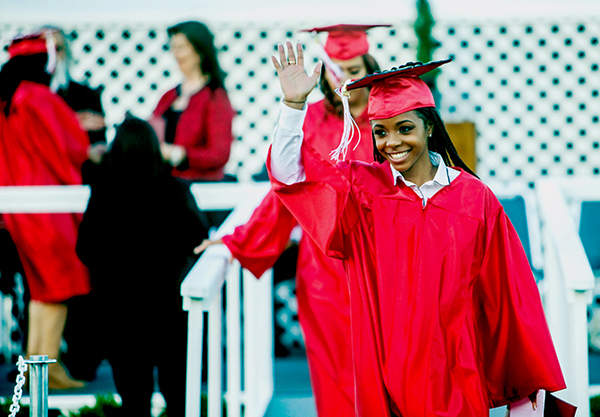 BELLFLOWER – Somerset Continuation High School graduate Alexis Nelson, speaking to her classmates at the school’s June 13 commencement, vowed to use her education to save future generations of disadvantaged children from the perils of inner city life. “I want to be able to help children, especially the ones who live in the inner city,” Nelson told 119 fellow graduates and more than 600 family members and friends who gathered for the ceremony at Bellflower High’s Ron Yary Stadium. “I want them to know that where they live does not determine their futures. Too many children who live in L.A., Compton, Watts, Long Beach and other cities are dying because of inadequate education,” she said. Nelson said her goal of giving back to her community and finding a solution to gang violence starts when she attends Cerritos College to study criminal justice, with plans to become probation officer. Nelson is also the recipient of the $250 Women’s Club Scholarship. Her speech moved audience members, who showed their pride in graduates by wearing customized T-shirts featuring student names and faces and even live-streaming the ceremony. ASB President Joel Murillo told his classmates to be proud of becoming high school graduates and to take pride in knowing that difficult times breed character. Murillo will attend Long Beach City College with help from a $250 Bellflower Leadership and Support Team (BLAST) scholarship, and plans to transfer to Cal Poly Pomona to major in engineering. Attendees were also treated to a speech by Mario Fedelin, executive director of Big Citizen HUB – a nonprofit youth program, fireworks and senior Kristie Guerrero singing “In My Life” by The Beatles. 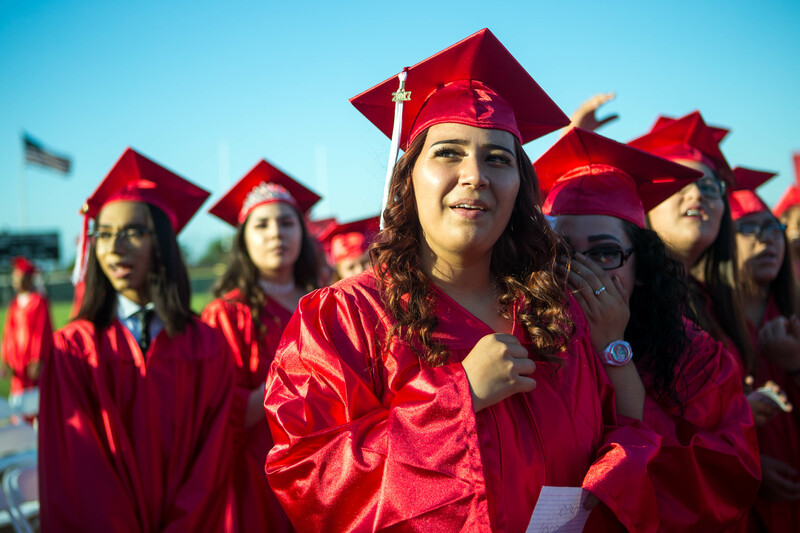 Somerset High’s seniors will attend a variety of institutions, including Cerritos College, Long Beach City College and Universal Technical Institute. Some 21 of the graduating seniors received scholarships totaling more than $5,000 from community groups and academic associations. BUSD_SOMERSET_HIGH1: Somerset Continuation High School Associated Student Body President Joel Murillo thanks the heavens moments after receiving his diploma during the school’s June 13 graduation ceremony at Bellflower High’s Ron Yary Stadium. BUSD_SOMERSET_HIGH2: Somerset Continuation High School graduate Krisite Guerrero sings “In My Life” by The Beatles for the Class of 2017 during the school’s June 13 graduation ceremony at Bellflower High’s Ron Yary Stadium. BUSD_SOMERSET_HIGH3: Somerset Continuation High School graduate Alexis Nelson waves to more than 600 howling attendees after receiving her diploma during the school’s June 13 graduation ceremony. During her commencement speech, Nelson said her life’s work will be to use her education to help inner city children. BUSD_SOMERSET_HIGH4: Kristie Guerrero (left), Joel Murillo (center) and Alexis Nelson (right) walk toward the school’s gymnasium to receive their diplomas and meet with their friends and family during Somerset Continuation High School’s June 13 graduation ceremony at Bellflower High’s Ron Yary Stadium. 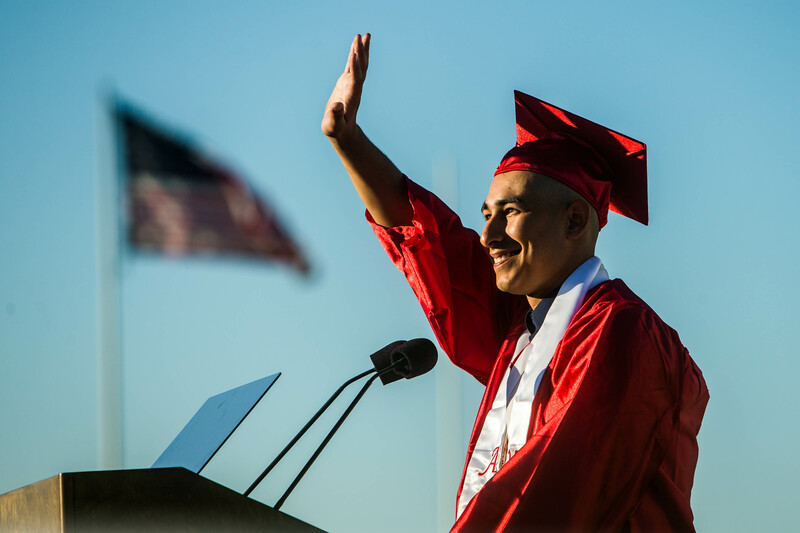 BUSD_SOMERSET_HIGH5: ASB President Joel Murillo waves to his mother, thanking her for her years of patient and support, during Somerset Continuation High School’s June 13 graduation ceremony at Bellflower High’s Ron Yary Stadium. BUSD_SOMERSET_HIGH6/8: Somerset Continuation High School’s class of 2017 excitedly look to for cheering friends and family members in the stands at the Ron Yary Stadium during Somerset Continuation High School’s June 13 graduation ceremony at Bellflower High’s Ron Yary Stadium. BUSD_SOMERSET_HIGH7: A Somerset Continuation High School graduate is showered with gifts and balloons after the school’s graduation ceremony on June 13 graduation ceremony at Bellflower High’s Ron Yary Stadium. 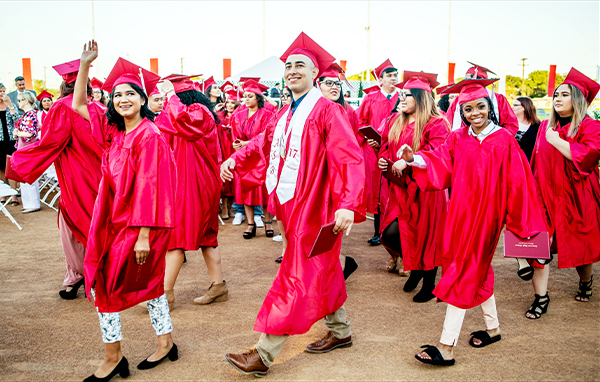 Kristie Guerrero (left), Joel Murillo (center) and Alexis Nelson (right) walk toward the school’s gymnasium to receive their diplomas and meet with their friends and family during Somerset Continuation High School’s June 13 graduation ceremony at Bellflower High’s Ron Yary Stadium. ASB President Joel Murillo waves to his mother, thanking her for her years of patient and support, during Somerset Continuation High School’s June 13 graduation ceremony at Bellflower High’s Ron Yary Stadium. 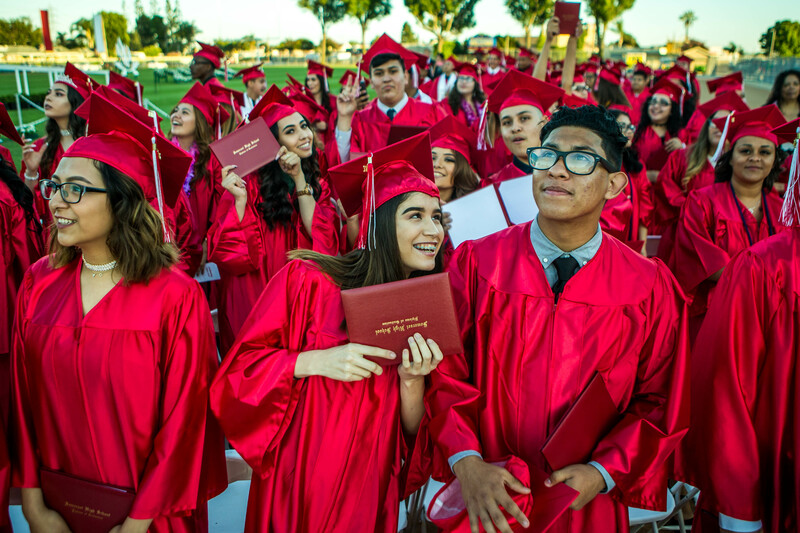 Somerset Continuation High School’s class of 2017 excitedly look to for cheering friends and family members in the stands at the Ron Yary Stadium during Somerset Continuation High School’s June 13 graduation ceremony at Bellflower High’s Ron Yary Stadium. 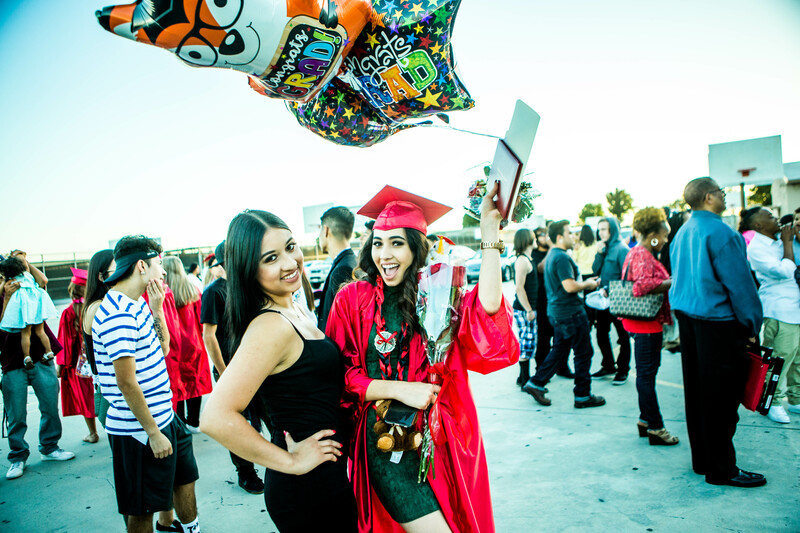 A Somerset Continuation High School graduate is showered with gifts and balloons after the school’s graduation ceremony on June 13 graduation ceremony at Bellflower High’s Ron Yary Stadium. 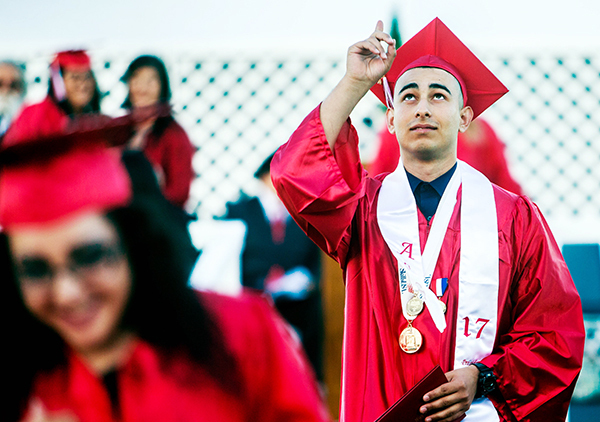 Somerset Continuation High School Associated Student Body President Joel Murillo thanks the heavens moments after receiving his diploma during the school’s June 13 graduation ceremony at Bellflower High’s Ron Yary Stadium. 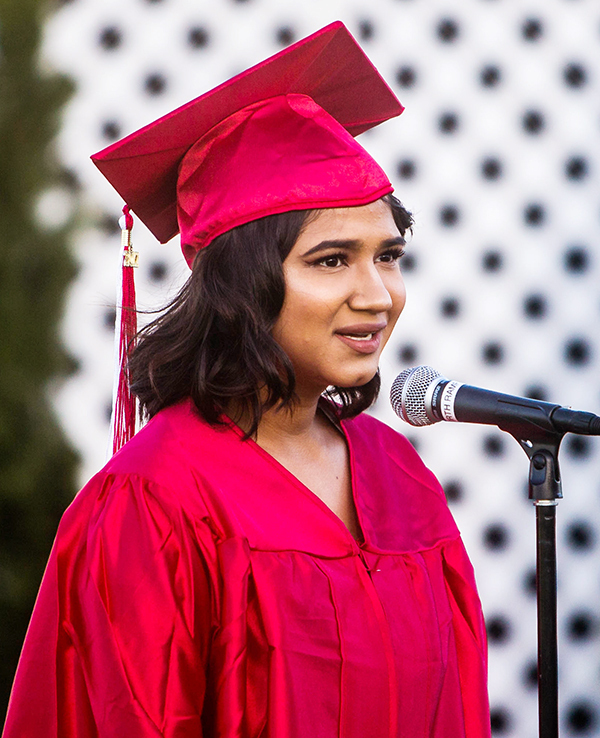 Somerset Continuation High School graduate Krisite Guerrero sings “In My Life” by The Beatles for the Class of 2017 during the school’s June 13 graduation ceremony at Bellflower High’s Ron Yary Stadium.